In my twenties I was hard work: I was too clever by half. I questioned everything. I had problems with authority. I made things harder for myself and others than I needed to, or should have done. Hopefully I have mellowed a bit, but these characteristics certainly defined me then. One of my bosses, a guy called Ambrose McNevin, once took me to one side, and gave me some excellent advice. I thought of this advice at Google Next 2018 last week. Google has undoubtedly started to play the game, and if you want to succeed in the enterprise that’s what you need to do. There was plenty of interesting technical news to cover last week – being able to run Google Kubernetes Engine (GKE) on premise is a huge marker, Google Cloud Functions is finally now a generally available product, Knative will almost certainly become the standard plumbing for functions as a service (FaaS) on Kubernetes, Google is determined to assert Istio leadership early in its lifecycle. But in many ways what struck me more was the tone and tenor of the conversations Google is now having with the enterprise. Case in point. Bjoern Petersen, president of Tyco Retail Solutions was talking on a customer panel about why the organisation had chosen Google. This point may not sound that telling at first, but Google has historically had a reputation for being somewhat high-handed when dealing with customers. Google as the best listener? That’s a very different Google. That’s a Google that’s going to win a lot more enterprise deals. Technical leadership with a touch of humility will go an awful long way. Almost every enterprise we talk to is currently planning a major infrastructure overhaul, generally based on Kubernetes. They start playing with Kubernetes before making a vendor selection, but before long they start looking for help, service and support. Being helpful at this point in the process pays dividends. Last year after Next 2017 I wrote about Google’s growing focus on Engineer to Engineer support – the approach is bearing fruit. In the era of the New Kingmakers, supporting and enabling effective communications between engineering teams at enterprises and vendors is a killer strategy because procurement and initial adoption have become fundamentally decoupled. Target was one of the big customer wins announced last week. The company has gone through an incredible transformation over the last 3 years, hiring more than 1000 engineers, and flipping the ratio of external contractors to internal staff on its head, from majority external to solid majority in-house. The hires are developers steeped in open source culture and technology. It has 45 active projects on Github with 6k active commits and a significant amount of inner source (internal code sharing using open source tools and methods) work going on. Target even offers transformation workshops to third parties at its dojo. Wait – did someone say New Kingmakers? Of course playing the game doesn’t just mean being more open to conversations about technology between engineers. You have to have partnerships with the likes of Deloitte, Accenture and PwC – check. Google’s partnering model is interesting in respect to partners – it now has a commitment that 100% of its enterprise deals have a partner attached. The professional services org always engages with at least one partner. At the beginning of 2018 30% of deals attached a partner. Today the number is approaching 80%. Channels love this kind of consistency. If they know they’re not going to be pushed out of deals they win they’re far more likely to bring Google Cloud into their enterprise accounts. You have to feature Oracle, SAP and Accenture logos in your keynote – check. That’s enterprise IT, baby. One area Google hasn’t made as much progress is in Windows support. AWS is way ahead there, and Google didn’t really mention Microsoft support this year, after claiming it wanted to be “the best platform for Windows” last year. On the other hand, Google did talk about G Suite a lot. Productivity tools is not a core research focus for RedMonk, and I am still not completely convinced about the organisational fit between G Suite and GCP. But it’s easy to forget that for many enterprises adopting G Suite is a Big Deal, seen as transformational even. In this light, the fit makes sense, and can be seen as Google playing the game. At the risk of diving into inside baseball, one of the ways vendors play the game in enterprise IT is to work with industry analysts. 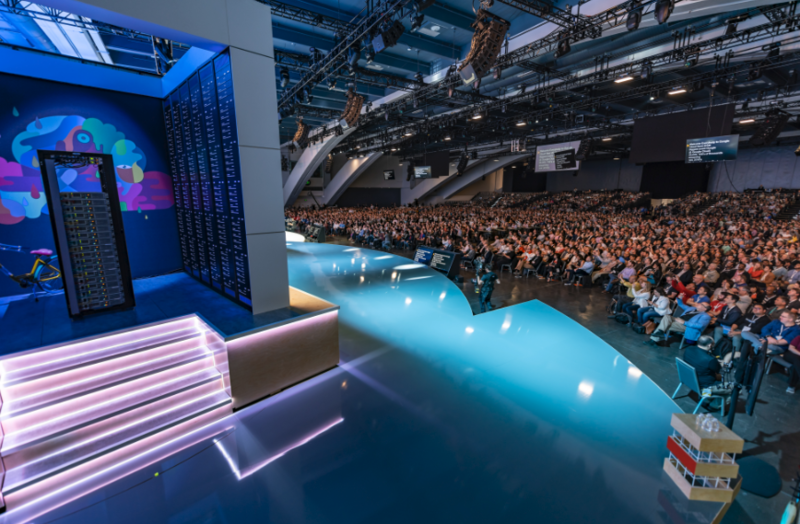 The analyst summit at Google Next 2018 was notable for its size. I would guess there must have been 150 analysts at the event last Monday. All of the major firms sent sizable teams. Google is of course playing on multiple fronts – security, cloud infrastructure, AI/ML, data warehousing and processing, PaaS, devtools and so on – so it is no surprise folks from various practices at these firms would attend. But the numbers were still notable. Google’s AR team did an excellent job with the material they had, and I think we’ll be seeing a great deal of positive coverage over the next few months. It’s not so long ago that Google’s global AR team consisted of essentially one person – the Stakhanovite Jennifer Kelly. Google Cloud didn’t even have it’s own staff. Over the last two years the situation has changed dramatically. Today the Google Cloud team is well staffed, and Sheri Matsuda did a great job marshalling resources. Google used to have a slogan Run Like Google. But most organisations aren’t really much like Google, to be frank. Google scale is so absurdly big. There was also a danger that the slogan reinforced the idea of Google arrogance. At Next 2018 Google unveiled a subtle but powerful shift on that way of speaking – the idea of Bringing The Cloud To You. This language also informs the transition to going all in on hybrid. Google now has a clean on prem story, and is aggressively talking up both hybrid and multi-cloud for customer choice. The keynote demo was excellent – first Google talked about the importance of a consistent operating model. It then showed off Stackdriver for monitoring GKE services. Finally it casually pointed out that one of the nodes being monitored was called Moscone, and was running in the conference center on a box running vSphere from VMware. Google also announced a partnership with Cisco, as you do when you penetrate the enterprise. Google’s on prem play will put its partnerships with Pivotal and Red Hat under stress, but all three vendors are playing to win. Google wasn’t going to stay away from on prem indefinitely. I look forward to seeing more about the packaging and partner model going forward – the keynote demo used vSphere 6.5, with GKE on prem, now in alpha, running on a Google hardened Ubuntu instance. Google is now doing the work for multi-cluster support. We can expect network and storage support from partners. The vSphere choice will make it far easier for traditional enterprise partners and customers to get on board. HSBC was already a solid reference for Google on the AI and ML side, and it has now emerged as a major customer for GKE as an app platform. Of course in being enterprisey there are some downsides. In my opinion it was a shame there wasn’t more code in the keynotes on days one and two. Some crucial aspects of the Google engineering story (notably around Firebase) ended up relegated to the developer keynote, but were not so well highlighted in days one and two. It’s super hard to please both developer and enterprise audiences, but I would love to see major tech vendors run their developer keynotes on day one – with more code, starting a bit later. All that said, developers that matter clearly got the message. There is plenty more to be said about platforms and technology, Istio, Knative and so on, but the first thing I wanted to call out in first impressions from NEXT 2018 wasn’t the technology, but the lack of a tin ear. In competing with AWS and Microsoft Azure the new found listening capability and leaning in to enterprises will be essential. But as GCP CEO Diane Green says, it’s playing the long game. Kubernetes won – so now what? disclosure: Google is a client, and paid T&E for my attendance to the event, but this is an independent record of the event. I totally stole the image above from the Google Next 18 site. I am assuming it’s the rack running GKE.